In a race billed as a rematch between the GI Kentucky Derby and GI Preakness S. winners, WinStar Farm LLC, Head of Plains Partners LLC, China Horse Club and SF Racing Group’s Good Samaritan (Harlan’s Holiday) stole the show with a powerful last-to-first 4 3/4-length tally in Saturday’s GII Jim Dandy S. at the Spa while making his first try on dirt. Guiseppe the Great (Lookin At Lucky) completed the exacta as the longest shot on the board at 14-1. The Derby winner Always Dreaming (Bodemeister) hung on by a head to finish third as the even-money favorite; Preakness hero Cloud Computing (Maclean’s Music) was last of five. It had been 26 years since a Kentucky Derby and Preakness winner faced off in a race at Saratoga. Sent off at 8-1 in this five-horse affair, last term’s GII Summer S. hero and GI Breeders’ Cup Juvenile third-place finisher, drawn widest of all, was immediately guided to the rail by Joel Rosario. 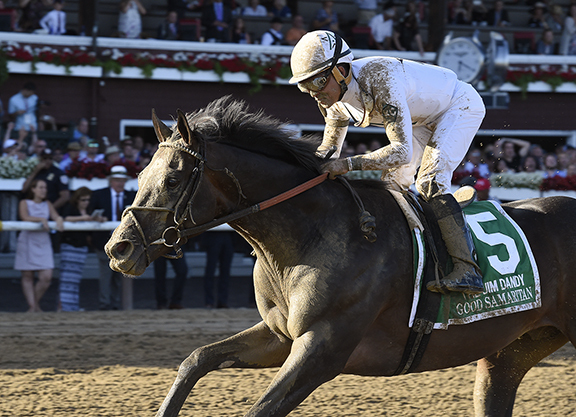 Good Samaritan, nominated to this year’s Triple Crown, was content to trail the field as Always Dreaming set an uncontested pace through opening splits of :24.13 and :48.53. Cloud Computing and ‘TDN Rising Star’ and impressive Santa Anita debut maiden winner Pavel (Creative Cause) drew alongside the pacesetter at the top of the stretch and the stage was set. Good Samaritan, still riding the rail while trailing the field at that point, began to wind up and was tipped out widest of all as they straightened for home. The others offered little resistance and Good Samaritan came flying down the center of the track to blow his competition away. Beaten only 1 ½ lengths while suffering his first career defeat as the 5-2 favorite in the big one at Santa Anita last fall, Good Samaritan made three previous starts in 2017. 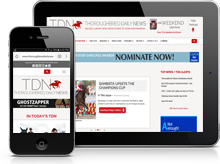 Second in both the GII American Turf S. May 6 and GIII Pennine Ridge S. June 3, the bay got going too late to finish fourth when last seen in the GI Belmont Derby Invitational July 8. Click here for Steve Sherack’s piece earlier this week on Good Samaritan with comments from Elliott Walden. Kenny Troutt’s operation bought Good Samaritan’s dam Pull Dancer (Pulpit), a multiple stakes-placed runner on grass for owner Cam Allard and trainer Kiaran McLaughlin, for $150,000 as a broodmare prospect out of the 2010 KEENOV sale. She is also represented by the unraced 2-year-old colt Brave Nation (Pioneerof the Nile), currently in training with Mott at Saratoga; and a yearling filly by Tiznow headed to the Keeneland September Sale. Pull Dancer had a colt by Bodemeister earlier this spring. Good Samaritan’s unraced second dam Mayhavebeentheone (Arch) is a half-sister to 2002 GIII West Virginia Derby/GIII Lone Star Derby winner Wiseman’s Ferry (Hennessy). This is also the extended female family of Bernstein, Caress, Sky Mesa, etc. JIM DANDY S. PRESENTED BY NYRA BETS-GII, $588,000, SAR, 7-29, 3yo, 1 1/8m, 1:50.69, ft.
Club, SF Racing Group; B-WinStar Farm, LLC (KY); T-William I. $767,616. Click for the eNicks report & 5-cross pedigree. B-Santa Rosa Partners (KY); T-Todd A. Pletcher. $60,000. Margins: 4 3/4, HF, HD. Odds: 8.60, 14.30, 1.10. Also Ran: Pavel, Cloud Computing.